Responding to the question posed on the Highlighting JAPAN website, "What is your favorite Japanese food?," foreign readers proposed a wide variety of Japanese dishes. We now reveal the top ten Japanese dishes, as chosen by our readers. Easily the number-one favorite Japanese food was sushi. Sushi has now become the food that people around the world think of first when it comes to Japanese dishes that are healthy and delicious. Sushi in its present form, in which raw fish is placed on top of rolled vinegar-flavored rice, was introduced during the Edo period (1603–1867). It became popular in the United States in the 1970s, later finding fans around the world. Ramen is a noodle dish that originated from Chinese noodles. Since arriving in Japan in the Meiji period (1868–1912), they have evolved in a uniquely Japanese manner. Japanese ramen is characterized by the variety of soup flavors, including soy sauce, salt and miso flavors, and a choice of toppings, such as meat, leeks, bean sprouts and eggs. Japanese ramen has even become popular in China recently. Sashimi is raw fish or shellfish served thinly sliced and flavored with soy sauce and other seasonings, as well as wasabi horseradish, ginger, and other spices. Sashimi is believed to have become popular in Japan during the Muromachi period (1336–1573), in tandem with the increasing use of soy sauce. Soba is a dish of noodles made of buckwheat flour that is milled from the seeds of soba grains, and served with soup. There are two main ways to enjoy these noodles. Zarusoba is soba noodles served on a bamboo draining board, which the diner dips in a cold sauce, and then eats. Kakesoba is soba noodles served in a bowl filled with hot sauce. Many soba restaurants offer free soba yu, the hot milky water in which the soba was cooked, to customers who order zarusoba. When customers finish their dishes, they may add sauce to the soba yu and drink it. Tempura is a dish of fish, shellfish, vegetables, and other ingredients that are deep fried in batter made of flour and water. It is believed to have come to Japan between the sixteenth and seventeenth centuries from Europe, and it became popular in the Edo period. There are several theories on the origin of the word "tempura," including the Portuguese words tempera (which means "adding seasoning") and tempolo (a temple). Udon is a dish of noodles that is made by mixing flour with water, stretching it and cutting it into noodles before they are cooked in boiling water. Udon noodles are thicker and chewier than soba noodles. As with soba noodles, udon noodles can be served as zaruudon, with diners dipping their noodles in cold soup, or as kakeudon served in a bowl filled with hot sauce. Udon noodles can be served with tempura, meat, curry and many other ingredients. Sanuki udon from Kagawa Prefecture, Shikoku, is particularly popular in Japan. Okonomiyaki is a pancake dish that is made of flour mixed with water with the addition of one or more ingredients such as shrimp, squid, meat and vegetables, and griddled on a hot plate. The finished pancake is served with a special sauce, mayonnaise and other seasonings. Okonomi means "whatever you want." There are two main kinds of okonomiyaki. One is the Kansai style, popular mainly in Osaka where the dough and ingredients are mixed and cooked. The other is the Hiroshima style, in which the ingredients are sandwiched between the dough when they are cooked. Shabu shabu is a dish of thinly sliced beef that is put in boiling water for a brief moment to cook and served with the flavored soy sauce ponzu sauce and other sauces. Vegetables and tofu are also cooked with the beef. The term "shabu shabu," an onomatopoeic phrase equivalent to "swish swish," was first used at a beef restaurant in Osaka in 1952. Miso is bean paste that is made of soybeans. To make miso, soybeans are first steamed and fermented after salt and rice malt is added to them. Along with soy sauce, it is a typical Japanese seasoning. Miso soup is a soup dish in which miso is mixed in hot water and cooked with tofu, seaweed, vegetables, and other ingredients. Tofu is a food made of soybean milk that is strained from mashed soybeans and solidified with brine and other coagulant. There are a number of tofu dishes. Hiyayakko, or cold tofu, is served with soy sauce, finely chopped leeks and other spices. Atsuage is tofu deep fried in a thin batter. Katsu curry is a dish featuring pork cutlets (katsu), which are pork slices covered with breadcrumbs and deep fried in oil, served on top of "curry rice," a dish of rice with curry. Katsu curry is believed to have originated in 1948 at a restaurant in Ginza, Tokyo, when a famous baseball player placed an order to put a pork cutlet on top of curry rice, because he found it was a hassle to eat the curry rice and port cutlet separately. Taiyaki is a cake made of dough, or flour mixed with water, that is poured and baked in a fish-shaped iron mold with red bean paste placed in the middle. It is believed to have been introduced in the Meiji period. In addition to red bean paste, some recent types of taiyaki have chocolate, custard cream or caramel in the middle. Mix one egg with cold water (one cup) and flour (one cup) in a bowl. Remove the heads and back veins from (six) shrimp, and make a cut in two or three places in the middle. Wash pumpkins, egg plants, asparagus, and other vegetables, and cut them to an appropriate size (see picture). Dust the ingredients with flour, dip them in the batter to fully coat, and fry in oil at a temperature of 170°C for about two minutes. Serve the tempura with tempura sauce and grated daikon radish. Or, just as good, serve with sea salt. "Sushi-go-round" has become an integral part of Japan's restaurant industry. Ishino Seisakusho, headquartered in Kanazawa, Ishikawa Prefecture, boasts the leading national share in the production of conveyor machines that circulate sushi plates, the arteries of the sushi-go-round business. "The demands of our customers are diverse, not only with conveyor machine sizes and design but also with the layout and atmosphere of the store," says company president Haruki Ishino. "It is important that we listen to each and every request concerning quality and to suggest the optimal conveyor." Riding the tailwind of the Japanese food boom of recent years, sales of Ishino Seisakusho's sushi conveyors are rising overseas as well. Having first entered the Hawaiian market in 1980, the company has since made its way into European and Asian markets such as China, and it exports its sushi conveyors to twenty-three countries around the world at present. Sushi-go-round stores overseas compete based on product prices with plate colors as do those in Japan, but the dishes that ride the conveyor in many stores include items other than sushi, such as bread, cake, fruit and kimchi, according to local preferences. Circumstances unique to some export destinations also demand different specifications in the sushi conveyor itself. Some products have originated from the overseas business. 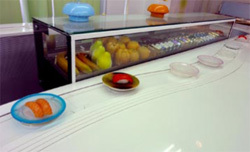 One of them is the flat-panel sushi conveyor, winner of the 2005 Good Design Award. Conventional conveyors circulate sushi plates on a belt formed of a chain of numerous crescent-shaped panels, but on the flat-panel conveyor, a round tray that carries a single sushi plate moves over a flat conveyor "road." Each tray has a magnet beneath it, and when the magnets underneath the conveyor road move, they move the trays with them. What one sees are trays of sushi gliding their way along the conveyor road. "The flat-panel sushi conveyor originated from a request made by a sushi restaurant in the United States where hygiene control is strict. The belt with all the plates chained together was difficult to clean, but with the flat-panel conveyor, cleaning is easy. We currently export the product to other countries as well," explains Ishino. "We hope to continue offering more sushi-go-round solutions that meet local needs."